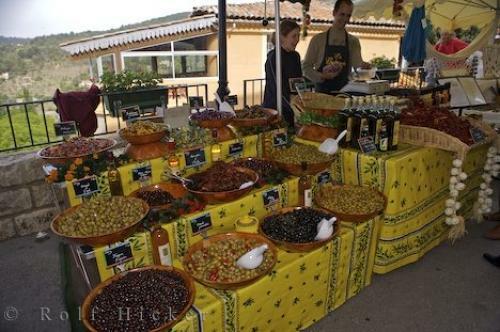 Many varieties of olives for sale at the colourful market stalls in the village of Moustiers Ste. Marie, Provence, France. Moustiers Ste Marie in the Alpes de Haute region of Provence, France is a delightful little village which clings to the side a limestone cliff. Just as most towns and villages in Europe the weekly, or sometimes daily, markets offer many kinds of fresh fruit and vegetables.The stalls are arranged allowing visitors to be able to view the different variety of olives and oil on these colourful stalls which would please all tastes. Most people who visit this market have never seen such an assortment of olives, so be sure you sample ones which you have never tried to ensure the olive is one in which you like.Varieties of Olives on sale at a Market Stall in the village of Moustiers Ste Marie, Alpes de Haute, Provence, France, Europe. Photo of a variety of olives at a colorful market stall in the village of Moustiers Ste Marie in Provence, France in Europe.